Hello! Today I have a very exciting post! 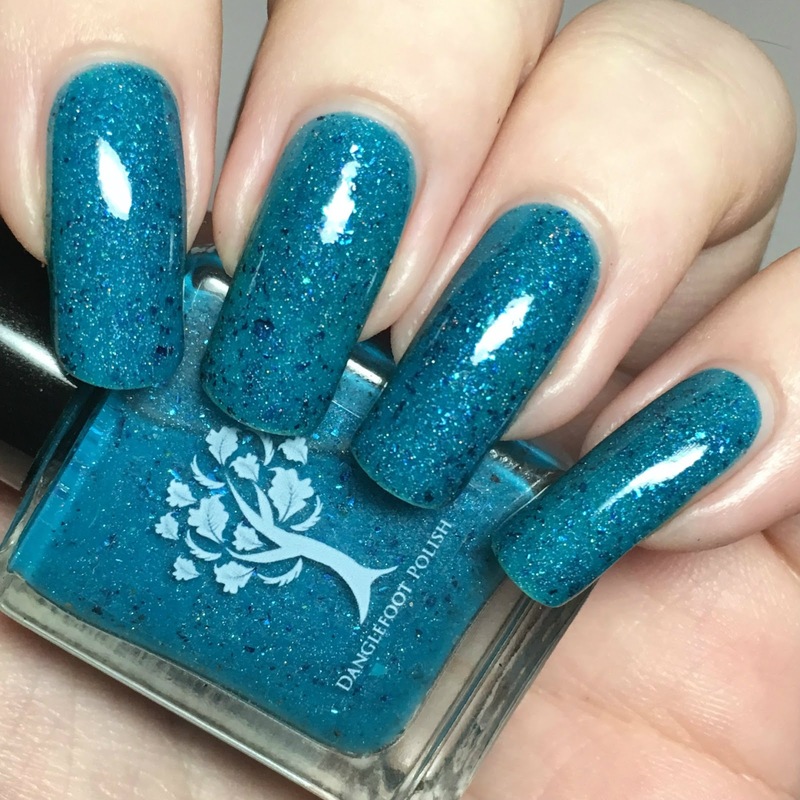 When Danglefoot Nail Polish reopens soon, a new Once Upon A Time Duo is releasing. If that wasn't exciting enough, this time the duo is a collab with me! I went for my absolute favourite Once couple - Belle & Rumpelstiltskin. Here are the final polishes. Read on for full swatches and more info! Rumpelstiltskin's polish is called 'Hello Dearie' (of course! 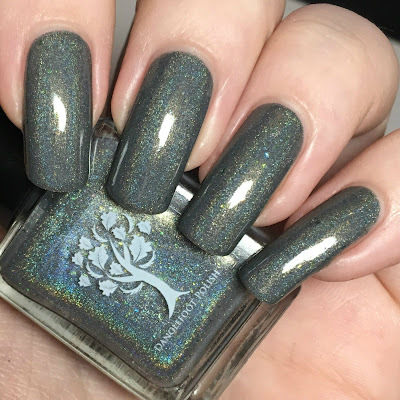 ), and is a pewter grey holographic with metallic green flakies and a gold shimmer - so basically Rumple in a bottle! The formula is very smooth and easy to apply, and it has great coverage on the first coat. It does need a second to deepen the colour and cover completely, but you could possibly get away with one thick coat. Below is two coats and topcoat. 'Belle' is a thermal turquoise base with scattered holographic, blue shimmer, and blue ultrachrome flakies. The turquoise base lightens up when warm to really show all of the holo, shimmer and flakies. Again this applies smoothly and easily, and is opaque in two coats. All photos below show two coats and topcoat. 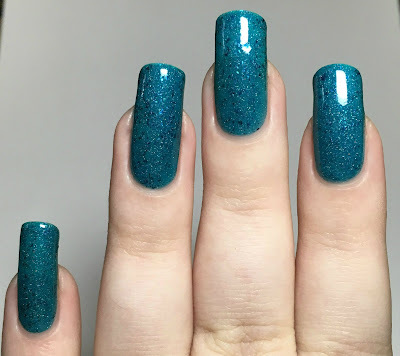 I was freezing while swatching this, so by the time I posed for a picture in the warm state, the polish would start changing back. However, I did manage to get a quick snap of the warm colour. Finally, here's a look at 'Belle' transitioning between the two states. I wore this for a good few days and it was constantly changing colours, I love it! What do you think? I couldn't be happier with this duo! I am so grateful that I managed to create these with Hayley - it's safe to say that they are my new favourite Danglefoot polishes! Both of them are very unique, and I can't think of anything quite like them. Yay! 'Belle' & 'Hello Dearies' will be available as a duo for a limited time when Danglefoot Nail Polish reopens on big cartel here. You can also follow Hayley on Instagram here. I hope you all love them as much as I do! Hello Dearies is fantastic!!! Mr. Gold/Rumple is my favorite. This makes me so happy! Tis the season for badass thermals. OMG, your nails are SO long! Such a pretty color, love the color change. Hello Dearies stole my heart. What a stunner! I love the shift of that thermal! Mmm I love thermals! 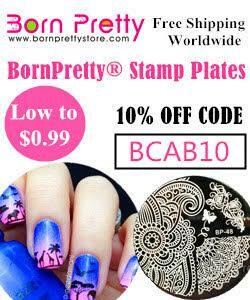 They look amazing on your long nails! 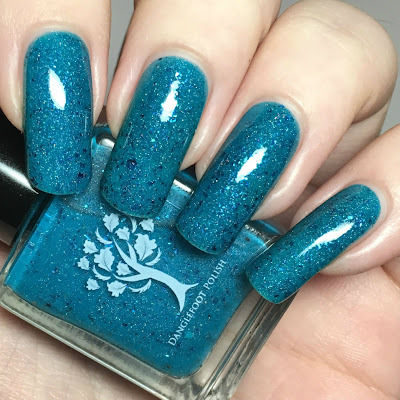 I really love the Belle shade when it's cold - stunning! Woah Becca! 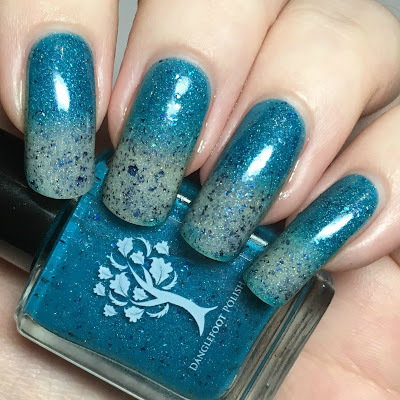 These shades are stunning, great job! These are so pretty! Thermals are just so cool. Both are very pretty! I tend to avoid thermals but Belle is calling to me! Those are stunning! I wish Danglefoot had an international stockist. Oh! I just adore Hello Dearie! So lovely! A nice duo & although Hello Dearies isn't a colour I'd personally wear, I think you nailed it. It suits him perfectly. 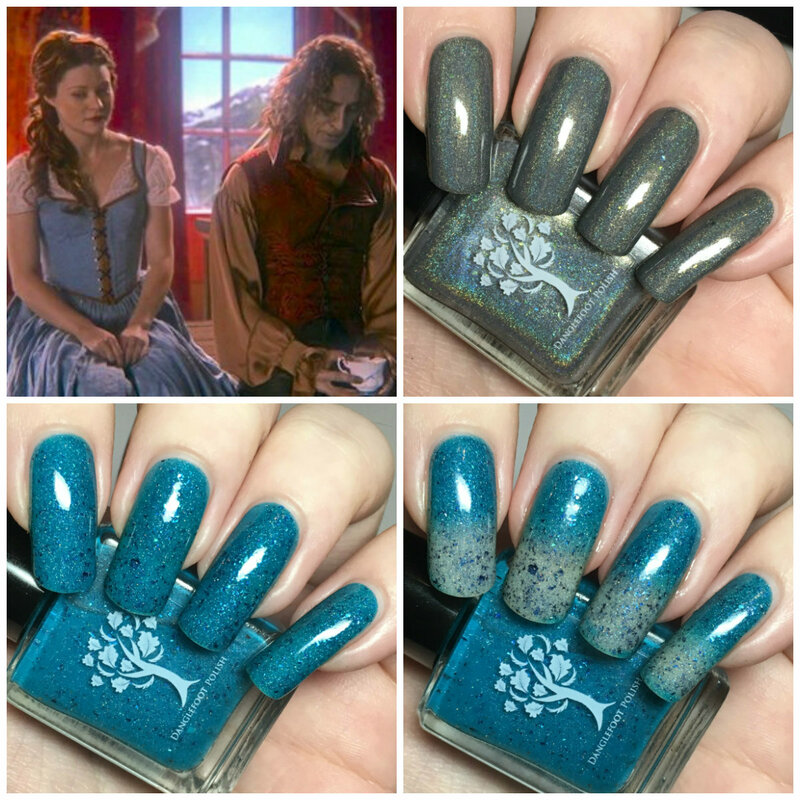 Belle is beautiful & I love how you created it to show the glitters when it was warm, gorgeous. I love the Belle shade in the cool state. The warm doesn't quite call to me, but it's neat it tended towards the cool state on you. I think it'd stay towards the warm state on me though. Gorgeous swatches. Both of these polishes look amazing. I love that I'm seeing Thermals come out again... back in the 90s they were all the rave and I love seeing it come back again. OMG!! They're my favorite couple too!! These colors are a perfect reflection of them!